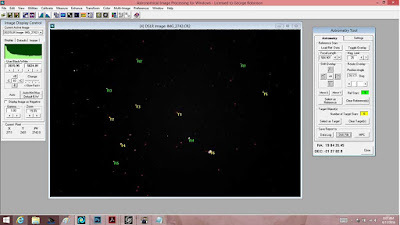 exactly planetary imaging, and secondly, I don't really yet do planetary imaging. What we have been practicing on so far is just being able to collect a little bit of light that reflects off the planets, not so much as make an image of a planet. So, onward to the goal of capturing reflected light from Pluto, planet or not. 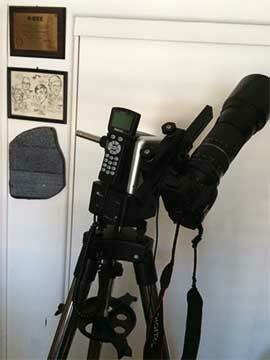 First, some folks were asking what kind of scope was being used to attempt a look at Pluto. Since I've gotten lazy in my old age, I much prefer to just set up with the lightest mount that has a chance of getting the job done, which is my little Ioptron AZ Mount Pro, using just a 600mm telephoto lens and DSLR. See below. The mount is an Alt/Az type, which is easy to setup and use for short image exposures, but not too great for long exposures. This goto mount is light weight and can be easily transported and set up, leveled and aligned in about 10 minutes, which is perfect for my data collecting objectives. Yes, it would be nice to have a pier mounted scope, with its own weatherized dome, but lets keep it real here folks. I find I can do a lot of practice with this easy setup and get ready for those times in dark sky environments when we want to bring out the big scope with its heavier mount and accessories. This will be especially true when we setup the spectrometer, which needs the heavier mount and 2 inch optical tube interface assembly. Ok, so I set up the mount and leveled it and performed solar system alignment using Mars. I then slewed to Fomalhaut and updated the alignment using that star. As part of the quality control process for this particular alignment, I slewed to M2 and M20 separately, as a check on how well the alignment affected the goto capability. Well, everything looked quite good and the objects were close to the center of the camera frame, all within an arc minute or two. Now was the time for the big test: Could Pluto be found in the camera image? Well, it turns out that the first obstacle was how to get the goto scope to go to Pluto. It turns out that since Pluto is no longer considered a planet, it was not longer listed in the hand controller. What to do now? The scope is all aligned, the sky is as dark as it is with city lights, and the scope can't be commanded to go to Pluto. Ok, so the next plan is to just enter the RA and Dec for Pluto and then go from there. So, with trusty IPhone in hand, I went to the SkyWatch app and found, again that Pluto was not listed. Now what to do? Well, at least the IPhone app had a switch on the setup page that allowed you to consider Pluto as a planet. Finally, I had the RA and Dec in hand and keyed that data into the scope controller and waited as the scope slewed to what seemed like the right position. I took several images at that location, some with 30 second exposure and some with one, two and three minute exposures. The mount seemed to track ok over that time frame so at least that looked good. It would not be until I went back to the observatory to check if the very dim Pluto was actually in the image. This image is the 3 minute exposure taken with 600mm telephoto. Hooray! This was a big step forward, now on to the next step and identify where the calculated position should be in the image. 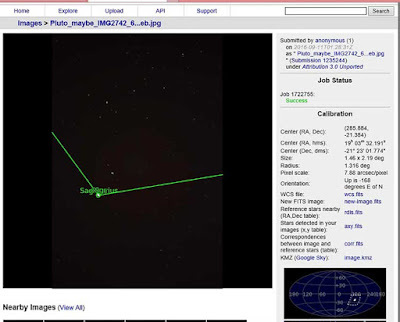 AIP4WIN software is now used to overlay the star pattern from the catalog for that little patch of sky and pick some possible target positions where you believe Pluto may be found. I've found over the last several occasions of using AIP4WIN and manually moving and sliding and rotating the star catalog overlay until it fits perfectly with the stars in the camera image is not all that easy. 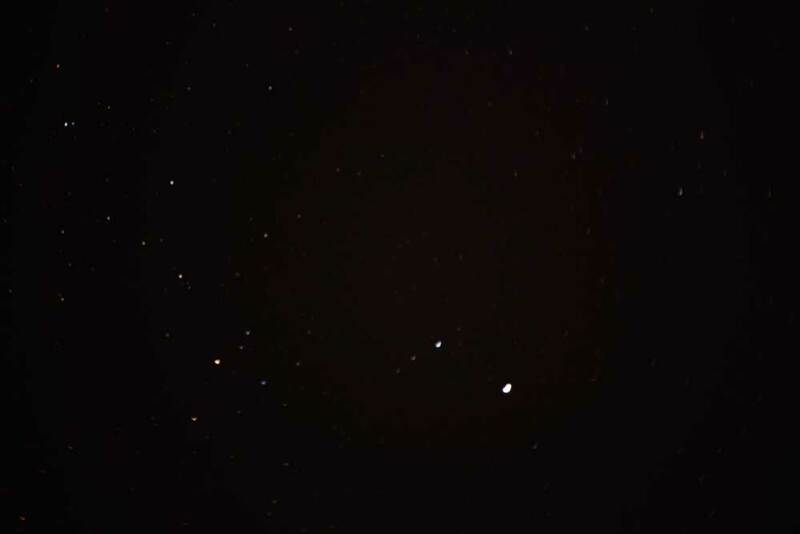 The stars seem to just blur into each other and the overall pattern of the sky is not obvious. So, a couple of hacks I now am beginning to use is to kludge the star catalog file to include a couple of artifacts that help locate the star field as it is moved over the camera image. 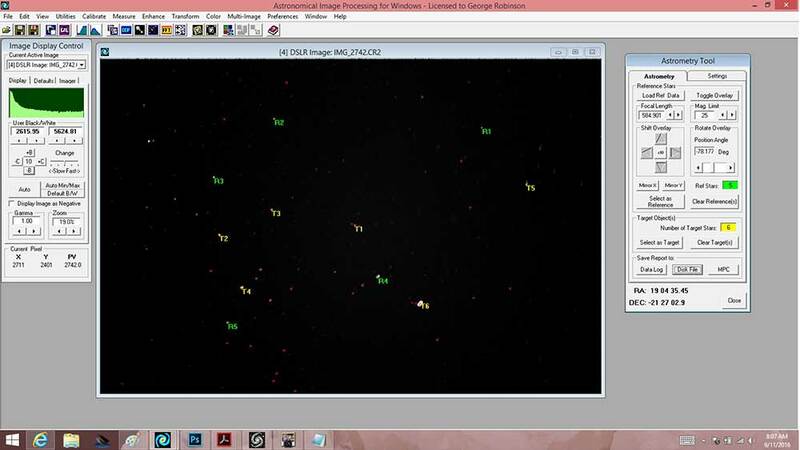 I mark the calculated position of the target with three circles by adding three fake star locations to the data file. These fake stars are arranged all in a row and one arc minute apart. 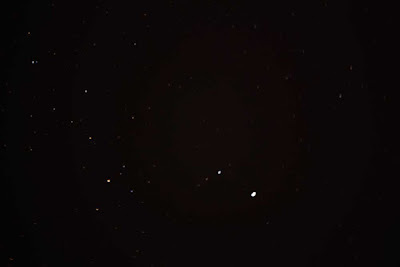 Oftentimes, there is a very bright star in the camera image that I can identify when looking at the catalog file. If so, then I add four other fake stars in a linear line around that star, two on each side, and then when I try to overlay this file on the camera image, I have some recognizable landmark (or should we say skymark) that helps find the actual layout. You can see my two hacks in the previous screenshot, where three circles in a line identify the calculated position of Pluto and five circles all in a line identify the location of the bright star in the sky. The final report then shows the measured positions of all the targets. See below. 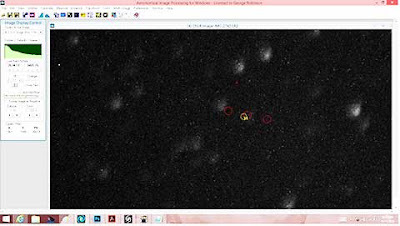 Now we know exactly where to look in the camera image and see if Pluto is actually there and visible. Well, it doesn't seem to be there. What happened? Ok, it is not visible. 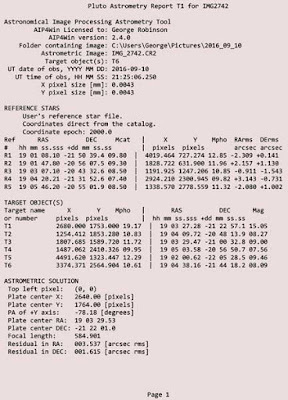 Remember, the predicted location of Pluto does not rely on my skill as far as aligning the scope, etc, but only relies on plotting and overlaying the star positions from the star catalog. Maybe Pluto is just too dim, but I know that some OCA members as well as other amateurs have captured Pluto. More about that in a moment, but what are all of the strange white blobs that show up in this magnified image? D you know what they are? I'm not sure, but they might be angry Plutonians, who are upset over the loss of planet status, or in reality and more likely they might be the result of dust on the camera lens. I've heard of such things but this is the first time that I might have actually got to the place in astrophotography where they made their appearance. More study and talk with the more serious amateurs is called for. Anyway, I wanted to cover one more topic relating the magnitude of Pluto and the magnitude of the skyglow around here and see if that is why Pluto is not visible in the image above. I have a conjecture that Pluto is not going to be visible from my location and this is based on a back of the envelope calculation showing the light from Pluto would be completely swamped out by the light from skyglow. Recall that from the photo of Neptune the amount of light was measured by the camera to be about 9000 counts. Each count being a function of the number of photons hitting each pixel and the length of time of the exposure and camera gain and other factors. The background sky around Neptune showed up in pixel counts as about 100. Now Neptune has reported magnitude of 7.8, while Pluto has magnitude of 14.2. This 6.4 difference in magnitude means that when you convert magnitudes back to actual counts of photons, that Pluto would be about 360 times dimmer than Neptune, which would show up as about 9000/360 = 25 counts. But this small number of counts is four times less than the number of counts just do to skyglow. To me, this means that the night sky here at the observatory is just to bright to be able to see Pluto. Getting a bigger scope will not help. Waiting for Pluto to be a little higher up in the sky would help a little bit. So, it just seems that capturing Pluto in the camera is just going to have to wait for some upcoming dark sky site observing.